Shopping around for a new car? Then you may well find that a larger car costs not much more than an average hatch back. Obviously this depends on the package and what looks affordable is soon dropped from the shopping list when a few options are considered. 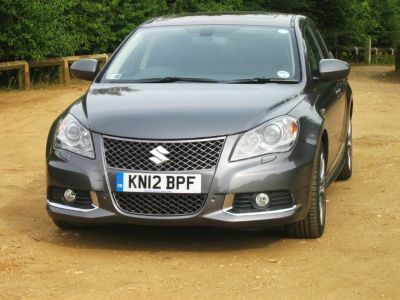 Not so Suzuki’s 2.4-litre Kizashi saloon, which debuted on the UK market at the start of 2012 and has been on sale prior to that in the USA, it comes with pretty well every piece of executive kit (except satellite navigation) one can envisage and there are no factory options listed. Get lost easily, want navigation? Then the dealer will arrange. So what you see is what you get at a price that I confidently suggest that disbelief, amazement and excitement could possibly be the reactions that this imposing looking car might generate. Interestingly, this is Suzuki’s first venture outside of its familiar remit of producing some highly rated small hatch backs and the ever popular Vitara SUV but the product has all round substance, clearly proving that the Suzuki team have done their homework to a very high degree. At this moment in time Suzuki has indicated that it is allocating only 500 examples to the UK market to test response though when pushed the PR man said that if needed an effort would be made to squeeze more out of the Japanese factory. Providing that the Kizashi message gets through to UK motorists then some midnight oil could be consumed back in Japan. There is only one version, the 2.4-litre petrol injected 4-cylinder engine being a development of a Vitarra power unit while the gearbox is a CVT selectable automatic and the drive can be either all wheel drive or just to the front according to the driver’s requirements. The lack of a diesel-fuelled alternative obviously limits the Kizashi’s sales potential. This is definitely no budget machine. Externally it gives the impression of an exclusive sporty saloon and internally the fascia, console and overall trim makes no sacrifices. It is a quality act. Inside it appears to offer generous accommodation for up to five adults (with average luggage requirements) though front head room might be challenging for the very tall but driver comfort I rated very highly; electrically adjustable seating with heating, a fully adjustable steering wheel and comfortable pedal positioning. Fascia presentation, instrumentation and other useful information are easy to see and the comprehensive switch-gear is clearly defined. Roof pillars are thin at the front, thick at the rear and the bonnet line drops abruptly which means driver vision is fairly good for a saloon body. Thus the impression is of a premium grade product that one would expect to perform as such. Certainly the handling, ride and steering response get good marks, the power unit is immensely flexible with good power delivery though I suspect more sporty performance could be extracted if a quick shifting manual gearbox was employed. The CVT automatic unit makes for an easy life but has to be urged to produce anything close to lively acceleration. OK, the transmission is responsive but a tad slow off the starting block, livelier after about 40 mph. Performance figures claimed by Suzuki give a top speed of 127 mph with acceleration from rest to 62 mph (100 kph) in 8.8 seconds. A carbon footprint of a Euro 5 compliant 191g/km qualifies for VED 1 rating of £250 a year while a combined MPG figure of 34 mpg is acceptable but nowadays not class leading for a car of this size/engine capacity. Oh for a diesel! Anyway it is not always the fastest or the most frugal that wins all the sales and the overall product and package I suggest is sufficient to attract sales, particularly for those looking for a touch of exclusivity. Those who have bought a new premium class car will be aware of the costs of the extras and will appreciate the value of this Suzuki. Here is just a few items that would normally bump up the bill - remote locking with button start, heated electric folding mirrors, leather upholstery, 60/40% folding rear seat with ski hatch, 8-speaker audio system with MP3/WMA function, paddle gear shift, tinted glass/rear privacy glass, cruise control, front/rear parking sensors, driver’s knee airbag, space saver spare wheel, HID headlights and much more. Viewed from all angles (just note the massive twin chrome exhausts) the Kizashi is a fresh and hugely competitive new kid on the block though my mind is a bit exercised regarding the name…perhaps Hawk or Eagle would be more appropriate for a make that has long offered a range of iconic Swifts! SOME RIVALS: Ford Mondeo, Vauxhall Insignia, Skoda Octavia, Toyota Avensis, SEAT Exeo, VW Passat. On road price from £21,995. British car sales rose by a stronger-than-expected 8.2% on the year in September, a key month for the auto industry as it marks a twice-yearly change in vehicle registration plates. “Launching the all-new Range Rover represents a major milestone for Land Rover, being the first exciting output from an unprecedented investment in premium vehicle technologies”, said John Edwards, Land Rover Global Brand Director. “The new Range Rover preserves the essential, unique character of the vehicle – that special blend of luxury, performance and unmatched all-terrain capability. However, its clean sheet design and revolutionary lightweight construction have enabled us to transform the experience for luxury vehicle customers, with a step change in comfort, refinement and handling”. VOLKSWAGEN: The Volkswagen up! Compact city car can now be had with a 5-speed automatic transmission. The unit is an automated version of the manual gearbox and costs £595. It is available on the Move up! and the High up! versions apart from the super economy Blue Motion variants. A fully electric up! is due for release in late 2013.